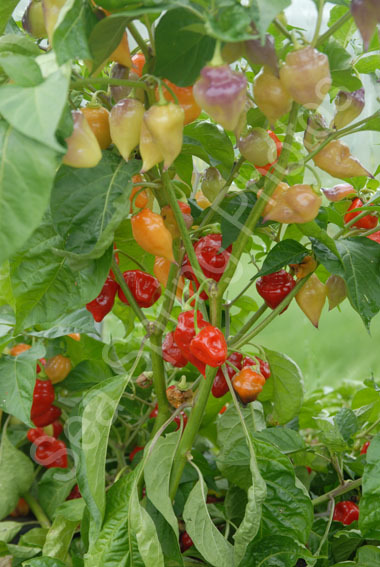 A beautiful Peruvian specialty that is not scorching hot even though it is a habanero and has that beautiful fruity flavour. The fruit are most top-shaped, but their shape can vary considerably, even on the same plant. They measure about 30 x 45mm and have a glossy skin that looks as if it has been polished. When they are young, the fruit are a light yellow colour punctuated with large patches of lilac purple. As they mature, they turn to orange and finally red. The plants are not overly tall and so can be grown in either in pots or the ground, though in both cases they will need support. A stunningly attractive plant that will lighten up any greenhouse or conservatory. Note: The term “Aji” is commonly used for chillies belonging to the species Capsicum baccatum. However, despite its name, this variety is a C. chinense; its name is the one given to it by the people who live in the region of Peru where it comes from. Fruit hang downwards. Their size and shape can be quite variable, but generally they are top shaped, about 30 x 45mm in size. The fruit are a light yellow colour punctuated with large patches of lilac purple. As they mature, they turn to orange and finally red. Plants grow upright, with strong branches. In a 7.5 litre pot the plants can be up to 3 feet in height. If grown in a 1 litre pot plants will be much smaller.